"At Staples, we’re committed to offering competitive pricing and remain in-stock all season long for convenient one-stop shopping, whether the preference is in-store or online. It’s important parents and students feel prepared so they can tackle the back-to-school season like pros." FRAMINGHAM, Mass.--(BUSINESS WIRE)--Staples, Inc. (NASDAQ: SPLS) today unveiled top trends in gear, tools, tech, and accessories for the upcoming back-to-school shopping season. Available in stores across the U.S. and on Staples.com, the 2017 back-to-school products are in stock all season long at everyday low prices, backed by the Staples 110% Price Match Guarantee. The new 2017 back-to-school trends include tropical patterns, animal-inspired designs, life-size Emoji prints, classic rose-gold accents, and easy personalization. 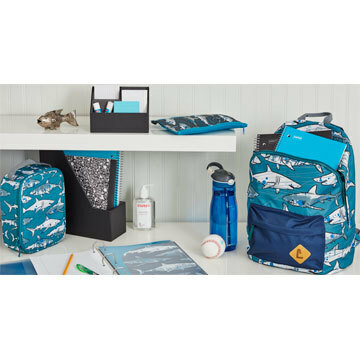 Exclusive designs across all Staples® Brand product categories make it easy to mix and match designs on backpacks, lunchboxes, notebooks, folders, pencil cases, binders, paper clips, and more. Curated by Staples’s product experts, these new trends exemplify Staples vast product assortment, allowing shoppers to get everything on their back-to-school lists in one trip. With a new spin on classic tools, this school year will feel new and fresh. The Staples® Better Binder ($8.49) and Staples® 3-Pocket Portfolio ($2.49) maintain functionality while allowing students to express their uniqueness through several designs. Add some glam to your binder with the Staples® Three Ring Binder Pencil Pouch ($5.00) and let note-taking rise above the ordinary with Staples® Licensed Notebooks & Composition Books ($3.00) and Staples® 1-Subject Spiral Notebook ($2.00). Wild tropical patterns featuring exotic animals and bold colors carry summer vibes into autumn with Staples® Kids Lunch Bags ($9.99) and Staples® Kid’s 16-inch Backpack ($19.99) available in a variety of exotic animal prints that kids can match (or mix), Nail Polish & Popsicle Highlighters 3-packs ($3.00), and Eccolo™ Tropical 2-Pocket Paper Folder ($2.49) in gold foil tropical patterns. Animal-inspired pieces like the 3M® Elephant Desktop Tape Dispenser ($7.00) and Animal Attraction Fashion Composition Book ($2.99) in blue elephant, pink flamingo, and turquoise whale also make practicality fun while bringing the animal kingdom to the classroom. Taking a page from the latest teen trend, these life-size Emoji pieces let students express their emotion and creativity with FunMoji Large Clutch Pencil Pouch ($4.99), Avery® Emoji Five-Tab Dividers ($3.00), and Emoji 2-Pocket Poly Portfolio ($2.00). The Emoji fun continues once class is out with the Bluetooth-compatible Jamoji Speakers ($14.99). With the latest planner and calendar designs, students, parents, and teachers can find their new favorite organization system, personalized to perfection. The 18-month The Happy Planner™ Sugar and Type Classic Planner ($29.99) and The Happy Planner™ Teacher Box Kit ($39.99) are great for the meticulous planner with an eye for design, while the Ashley G for Blue Sky Wall Calendar ($16.99) and the Denik Layflat Planner ($15.99-$19.99) offer ample writing space and easily customizable planning. Quirky touches add some unexpected fun to the back-to-school shopping list, with everything from a Monster Puppet on a Pen ($3.00) to the Fluffle Pencil Pouch with Key Chain ($8.00), and even jars of Donut and Macaroon Erasers ($4.00) that almost look good enough to eat! Students can step up their locker decoration game with a Light Up Locker Mirror ($9.99) and Locker Luxe Geometric Chandelier ($16.99). The hottest tech products are at Staples this back-to-school season, like the Staples® Youth Stylus ($16.99) that enables children to navigate tablets and touchscreens easily with a kid-friendly crayon shape and the Acer Aspire 3 Notebook (as low as $259.99), Staples® Earbuds with Microphone ($19.99), and Staples® Headphones ($10.00) boast great quality and a sleek finish, and are perfect for students’ on-the-go needs in the classroom and after school. Back-to-school isn’t just for kids, with an assortment of fashion-forward essentials for parents and teachers. The exclusive 40-piece DwellStudio collection features fashion-forward modern office organization supplies, including DwellStudio Fashion File Folders ($6.99) that add texture and color to file cabinets, the DwellStudio Document Envelope Pouch ($24.99), perfect for storing loose documents on-the-go, and the DwellStudio Fabric Journal in the Gold Foil Gates Pattern ($14.99). Organization for the classroom or home office is a snap with the Office by Martha Stewart™ Discbound Project Pockets ($4.99) or the Office by Martha Stewart™ Wall Manager ($2.99-$17.99), easily customizable with multiple accessories and add-ons. For more top trends and photos throughout the season, visit the Staples lookbook. For media information, visit the Back to School 2017 press center.